You might be surprised by how many coffee drinkers out there don't realize that one of the most important factors in the perfect cup of a coffee is the coffee grind. This is even more so the case when it comes to espresso which requires the finest of grinds. The coffee grind directly connected to precisely how the flavor of the coffee bean is extracted. 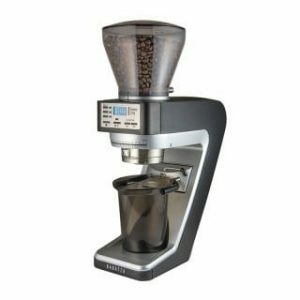 Having said that, there's a good chance that anyone who is in the market to spend a few hundred dollars on a coffee grinder is well aware of this fact and can attest to its accuracy. Finding the best quality coffee grinder can be the difference between a very mediocre cup of coffee and a perfect one. This week, we take a look at a one of Baratza's most impressive all-around grinders: The Baratza Sette 270. Check out our Baratza Sette 270 review below to get an idea of why we think so. Who is the Bartza Sette 270 for? The Baratza Sette 270 was created with the home espresso enthusiast in mind. Alternatively, this is a great entry-level machine for the prosumer barista. With its intuitive controls, the Baratza is particularly attractive to those who first want to learn the basic mechanics of espresso making before getting extra fancy. The machine's intuitive grind adjustments afford the user unmatched precision in creating that perfect cup of espresso or coffee. This exceptional coffee grinder also has a very low retention rate ensuring minimal waste. As a result of this, the Baratza Sette 270 makes for a great single dose grinder as well. While a coffee grinder's looks certainly isn't the most important thing, it's always nice when your coffee equipment doesn't look like it came out of a 1970's diner (unless that's the look you are going for which I could totally relate to.) Fortunately, its sleek and modern design is a welcomed sigh of relief to those who know what it's like to have an unsightly piece of equipment mar a near perfect kitchen decor. No Bartaza Sette 270 review would be complete without mentioning the machine's nearly unbelievable speed. It's 40mm conical burrs achieve speeds that are blindingly fast. And when I say fast, these are speeds that are easily comparable to a full commercial coffee grinder. It can do 18g in less than 6 seconds with minimal retention. One thing to consider in purchasing this grinder is that it is loud. Depending on how much of a concern noise is for you, this may deal-breaker. In wrapping up this Baratza Sette 270 review, the verdict is that this masterfully-crafted piece of machinery is simply one of the best all-around coffee / espresso grinders on the market. It's often been described as the ultimate ‘no-fus' machine that would be fulfill the needs of anyone looking to brew their espresso from the convenience of their own home. Attractively priced at $379, it's a true steal especially when you consider its array of practical features. If you've tried this product and would like to leave a Baratza Sette 270 review, we'd love to hear from you.